Hurricanes Irma and Maria hit the US territory of Puerto Rico in the autumn of 2017. Four months later, Antonio “Tito” Valentín stands on a formidable bridge just outside his home of Tetuán, Puerto Rico. Tall and gregarious, Valentín waves his arms to show the length of the new bridge, made of freshly poured cement and rebar. It crosses a mountain stream deep in the most rural hollows of the island. Maria swept away most of the original 25-year-old concrete bridge. “We are in the highway of the hurricanes,” he says. The loss of the bridge isolated much of Valentín’s community of several hundred residents. A few weeks after the storm, they decided to pool their knowledge and resources and rebuild it – slightly bigger – themselves. Valentín, who is director of the non-profit organisation Corporación de Salud y Desarrollo Socioeconómico del OTOAO, says what would take a government-hired contractor a month to do, and cost thousands of dollars, the community members here built within four days, for a fraction of the cost. Juan Rivera, a subsistence farmer in Utuado, Puerto Rico, stands in front of coffee shrubs destroyed by Hurricane María. Coffee plants take three to four years to grow. Photo: Rebecca Kiger. To prepare for what could be more intense hurricanes, Valentín says his community in and around Tetuán is working on projects to cultivate more diversified power generation systems, more robust and accessible health systems, and a diversified, viable economy. He says the goal is not only to survive, but to thrive. “We can work to resolve the crisis and that’s all. But if we want to make these communities healthy, we need to think of long-term projects and long-term impact,” says Valentín. Pablo Méndez-Lázaro has been visiting the rural community in the region of Utuado regularly since the storm, as part of his research at the environmental health department at the University of Puerto Rico. For the past decade, Méndez-Lázaro has studied resilience in the face of extreme weather. He says he’s observed a shift in attitude in rural Puerto Rico since Maria and Irma swept across the island in 2017, and that many fundamental principles of resilience are organically evolving within the community of Tetuán. “Before the hurricane, they were trying to follow the governmental processes. Right after the hurricane, they changed strategy,” Méndez-Lázaro says. With already well-established neighbourly bonds and organisation, the community was able to be flexible and agile and respond efficiently and effectively to disaster. Méndez-Lázaro says the community now has more confidence. Their goals are complex, tackling health, infrastructure, and education challenges, while considering the local and global environment. He says they’re also willing to recognise limitations in knowledge and to cultivate relationships with outside partners who can provide valuable skill sets, which is especially important, as Hurricane Maria led many of Puerto Rico’s professionals to move to the mainland United States, where their American citizenship may have facilitated their transition. With a daunting US$74 billion of debt (and an additional US$49 billion in unfunded liabilities according to Financial Oversight and Management Board for Puerto Rico), the economic outlook for Puerto Rico – especially rural areas – is bleak. “Valentín and his group have very big goals. And he knows when you talk about public health and when you talk about improving quality of life, you need to provide employment,” Méndez-Lázaro says. Valentín hopes to bring industry back to his region and he’s especially focused on agro-tourism. He’s building farms where visitors, young people, and retirees can stay, work, or volunteer – away from the stresses of modern life. Standing in Tetuán looking out at the lush green mountain horizon, it’s easy to understand this vision. Despite the challenges to reinvent itself, to develop more sustainable food, energy, and infrastructure practices, it’s hard to feel hopeless while breathing in clean, cool, peaceful mountain air. 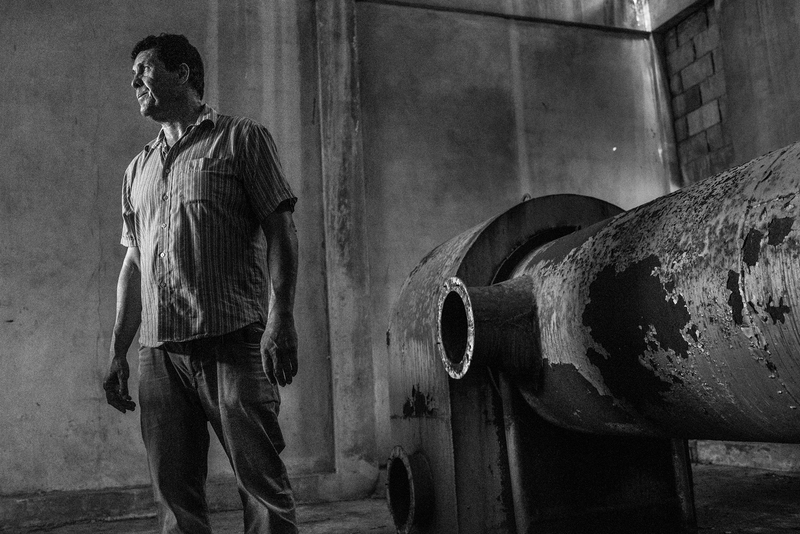 Tito Valentín, a community leader in Utuado, Puerto Rico, stands inside an old coffee-processing plant, which he hopes to revitalise for agro-tourism. Photo: Rebecca Kiger. Valentín has been the director of Corporación de Salud y Desarrollo Socioeconómico del OTOAO for the past five years. The organisation serves about 7,000 residents in and around Tetuán. His organisation has acquired several abandoned buildings and properties that are being transformed into solar-powered community health resources, such as a clinic and outdoor exercise spaces. A year before Maria struck, the organisation also acquired an abandoned coffee hacienda. The coffee-processing structure was built in the 1950s or 1960s, and survived hurricanes Irma and Maria without much damage. This notion of recycling good ideas from the past comes up again down the road, literally: when Valentín stops on a narrow, twisting mountain lane where community members are gathered clearing mud Maria left behind. Most people here are low-income farmers, he says, so they only ask community members to provide the fuel to run the dozer. 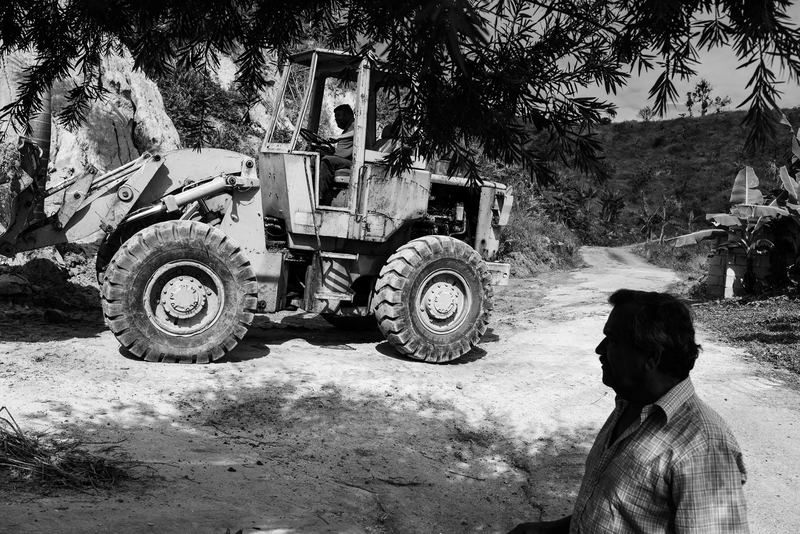 Using a community bulldozer, community members work to clear roads over three months after Hurricane María. The machinery is shared without charge. Photo: Rebecca Kiger. Farms here are small and diverse, and farmers are aging. Crops of coffee, plantains, citrus, and papaya were flattened by Maria’s up to 240-km/h winds. 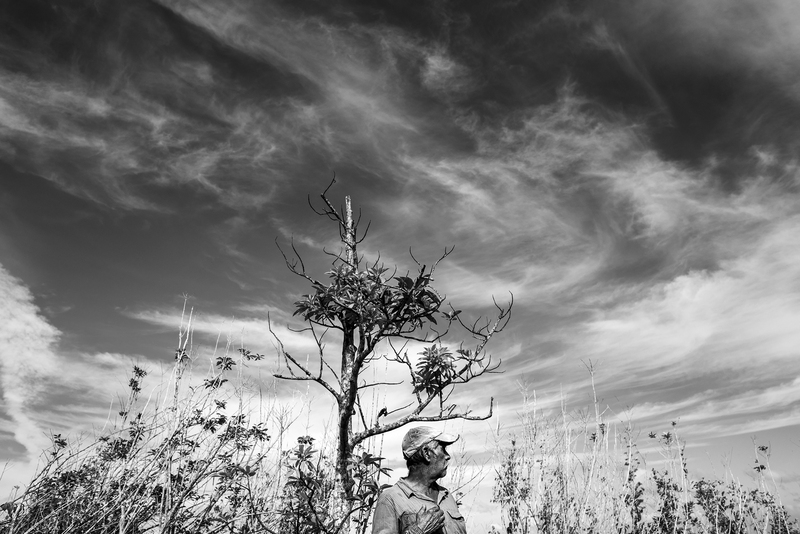 And like Valentín, farmers talk about climate change as a new reality. As these communities are predominantly Catholic, religion is an integral part of their life, but faith in God alone could not protect them from Maria’s wrath. Puerto Rico imports about 85% of its food – now even more, as farmers have had to restart their farms from scratch after the 2017 hurricane season. While channels to access food are at least well-established, most isolated communities had to dig out to reconnect to them after Maria, which took weeks. Everyone in interior island communities lost weight after the hurricane turned the whole island to mud. Even so, four months after the storm, everything was green again. Another farmer points to a steep hillside where he used to grow coffee. Now he is harvesting 23-kg pumpkins. “After the hurricane, the wind carried seeds, and plants appeared in different places. That’s the case with this vine of pumpkins,” he says. Root vegetables survived, too. Many Puerto Rican farmers talk about how the indigenous Taíno people who populated this island before Columbus arrived – opening an era of colonisation – used to grow a lot of root vegetables. Subsistence farming was hard living that fell by the wayside years ago, but according to William Gould, research ecologist and director of the US Department of Agriculture’s Caribbean Climate Hub, there is a movement to “return to the land” and to grow local plants as food. One group has bypassed machinery and is using sure-footed oxen to plough and manage the steep terrain more easily. Gould says that technology found in use on large industrial farms today – such as automated sensors and drones – is helpful, but the farmers with oxen didn’t have to wait for power or fuel and were some of the first back on their feet after Maria. 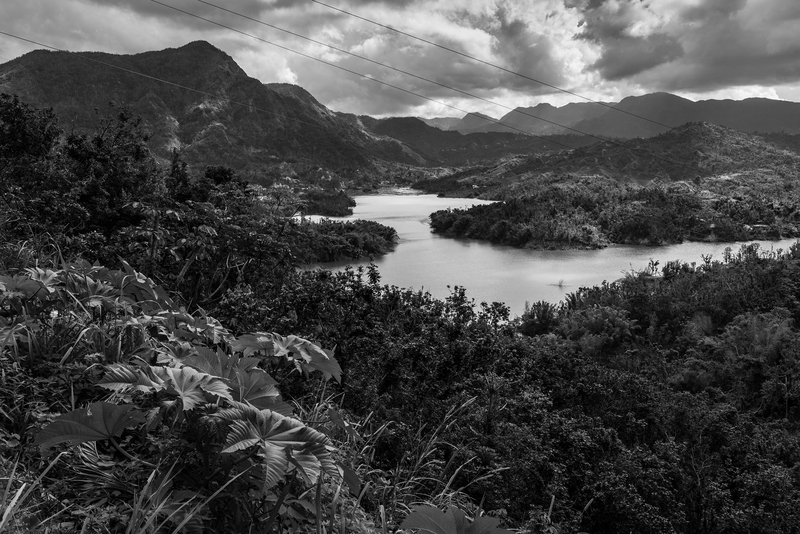 A view of Las Dos Bocas, a reservoir and dam constructed decades ago to provide hydropower to the municipality of Utuado, Puerto Rico. Restoring the hydroelectricity project is estimated to cost up to US$150 million. Puerto Rico had the longest blackout in US history after Hurricane María, and residents of Utuado were some of the last to receive power. Photo: Rebecca Kiger. But Valentín also knows and appreciates the value of diversity, and the revitalising effects diverse perspectives and assistance can bring to isolated communities. The storms were very damaging, he says, but they also brought visitors and attention to pre-existing needs. One such visitor to the rural, interior region was Alyssa Curran. At the time a master and urban planning candidate at the Harvard Graduate School of Design in the United States, Curran and a group of interdisciplinary students turned their focus to Puerto Rico as part of the Climate Solutions Living Lab, a course in their programme. Their goal was to examine and develop solutions for reducing greenhouse gas emissions and creating multiple co-benefits such as improved economy, cost savings on utility bills, innovation, technology, or public health benefits. “Our team was supposed to be focused on distributed energy resources, and after the hurricanes hit Puerto Rico, it just became a pretty obvious geographic area to focus on,” she says. Curran met with people working in as many systems in the Utuado region as possible, from the small business community, family medicine, teachers, urban planners, social justice advocates, people in the legal profession, former government officials, branch managers for water and energy authorities, and representatives from the US Federal Emergency Management Agency. Ideas emerged, such as adding solar to the roofs of key community buildings. Residential solar was quickly deemed cost-prohibitive for the majority of rural Puerto Rican populations, where the average yearly income is about US$13,000 per year. But the idea that stuck was a community-managed electric cooperative based around hydroelectric units that were built into human-made island dams in the 1930s and 1940s. Curran says the island shifted away from hydropower towards fossil fuel power sometime after the 1950s. “It’s kind of still unclear to me why hydro was abandoned in the way that it was,” she says. Today a coalition of local communities led by the non-profit organisation Unidos por Utuado is forming a hydroelectric cooperative. The organisation’s executive director, C. P. Smith, says Utuado residents could have been the first on the island to have power restored, but instead most went without electricity for nearly a year after Hurricane Maria struck. Smith estimates that restoring those hydropower units would cost between US$120 million and US$150 million and, given the island’s current debt, there is no way Puerto Rico can afford the project. “We would not be where we are today without a number of organisations – importantly – that are outside the island,” he says. He stresses that any glorified image of the self-reliant, self-sustaining rural community is a dangerous mirage. In the months following Maria, he’s watched as local businesses have continued to close shop. He says the sobering and daunting reality is that without significant governmental policy shifts on the island and within the US government, and without outside assistance, Puerto Rico will almost certainly see much more difficulty ahead. Back on the ridgetops of rural Tetuán, Valentín shakes hands and laughs heartily with another visitor to his community: Captain Juan Carlos Villa, a Colombian-born family physician with the Puerto Rico National Guard. Villa ran a makeshift urgent-care centre in remote Tetuán for more than three months after Maria. He reflects on how dedicated people are to their land, and how unlikely they would be to leave, despite severe economic hardship. “This is where their family grew up. The elders have lived and died here. They love the land and they love the peaceful life that they have here,” Villa says. A well-established anthem reverberates throughout Puerto Rico: Pa’lante! Loosely translated, it means “onward!”. The motto captures a spirit of determination that is a common trait of Puerto Ricans. As new environmental realities force islanders to reckon with the natural world in all its complexities, well-organised communities like Tetuán are acknowledging a messy reality where the outside world and technology both intrude and offer solutions. 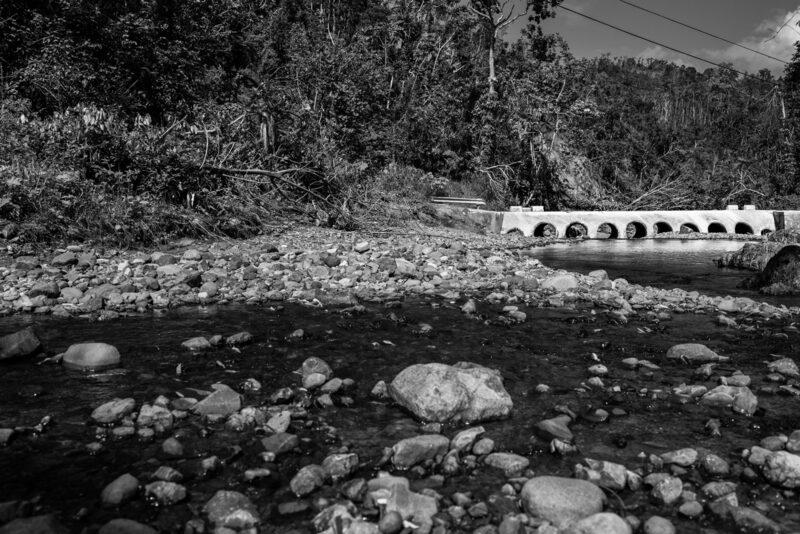 Opening image: A newly built bridge crosses a stream in the mountainous region of Utuado, Puerto Rico, January 2018. Hurricane María destroyed the bridge in September 2018, leaving people in the mountains unable to reach the resources needed to survive. Local residents rebuilt the bridge in the absence of government aid or support. Photo: Rebecca Kiger. In August 2017 Hurricane Harvey flooded whole communities in Houston. With predicted increases in extreme weather events, city planners across the globe are faced with the task of working with, rather than against, nature. Ancient religious practices protected rice crops and coral reefs for centuries in Bali. These farming practices can inform future management there, and help people see landscape-level patterns elsewhere.